Deep in the heart of one of Jakarta's most deprived slums stands an impenetrable high-rise apartment block. To most it is 30 floors of Hell to be avoided at all cost but for many of the city's most dangerous killers and gangsters, including the area's most notorious crime lord, it is a fortress-like safe house protecting them from the law. Even for the bravest and most experienced police officers it is considered a no-go area. In a desperate bid to flush these violent criminals and their leader from their haven once and for all, an elite SWAT team is tasked with infiltrating the building and raiding the apartments floor by floor, taking out anyone who stands in their way. Cloaked under the cover of pre-dawn darkness, the SWAT members make their move and enter the block not realizing that this is the easier part of the mission. Once inside, it soon becomes terrifyingly apparent that the real problem at hand is surviving long enough to be able to get out again. Having first made his mark with the hugely impressive 2009 Indonesian martial arts actioner Marantau Warrior, Welsh director Gareth Edwards cements his reputation with the critically acclaimed The Raid (Serbuan maut – released as The Raid: Redemption in the USA) by Village Voice as "Lean, fast-moving, and filled with game-changing fight sequences that have a brutally beautiful (or beautifully brutal) quality, Gareth Evans's Indonesian martial-arts film The Raid: Redemption lives up to its viral hype" and Ain't It Cool News as "a straight shot to the nutsack that hurts so good that the only way to make it feel better is to ask for someone to hit you one more time even harder." Ouch. Even The Guardian was impressed: "This violent, intense and brilliant bullet-fest from Indonesia puts western action movies to shame... a skull-splinteringly violent, uncompromisingly intense and simply brilliant martial arts action movie... completely deranged and completely superb." 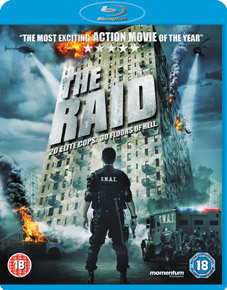 The Raid will be released on UK DVD and Blu-ray by Momentum Pictures on 24th September 2012 at the RRP of £17.99 for the DVD and £19.99 for the Blu-ray.